Please Note: In 2007, a competitive breeder put nasty untrue things on the internet about us,after a threat to do so, under many aliases and with the help of several friends. None of this is true.. I now have emails from several of these people including her now ex boyfriend apologizing for doing so. Please do not believe everything you read on the internet. It NEVER comes down unfortunately...ask us.. We are proud of our beautiful healthy puppies, and have literally dozens of references to show for it. Second and third time buyers over our 20 years of breeding......thanks. Ch Windancers Bobby Shafto Gone to Sea & daughter "Phoenix"
We are located in the beautiful Ozark hill country, just north of Springfield, Missouri. We have been breeding Newfoundlands since 1994. Thank you for visiting our web site. We hope you enjoy your time with us. 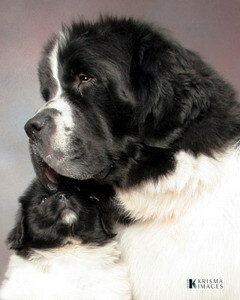 We are dedicated to the breed and know that once you get to know the Newfoundland, you will Love them too!